Coming to Costa Rica? Want to go to Costa Rica? All birders should say yes because the small country where I live is easier to visit than a lot of people think. If the home birding patch is in Canada or the United States of America, it’s not really that far. Get on the plane anywhere from North Carolina to Texas or Florida and we are talking three to four hours. Yeah, quick enough to study the field guides and get psyched with recordings of vocalizations during flight and have time to spare. Oh, if you hadn’t realized, it is a really birdy place too. Lately, I have been waking up to the vocal antics of Laughing Falcon, the newly split Gray-cowled Wood-Rail, Grayish Saltator, Melodious Blackbird, and this beautiful male Blue Grosbeak that sings about a block away. I don’t live in the forest either (unfortunately) but near a green patchwork of farm fields, second growth, and a riparian zone flush with trees. I get some birds here and can expect some sweet avian surprises now and then (a rare migrant Black-billed Cuckoo would be nice for the year…), but my bird neighborhood is still nothing compared to the other side of the mountains. Over there, about an hour away by car, is a site called, “Virgen del Socorro”. 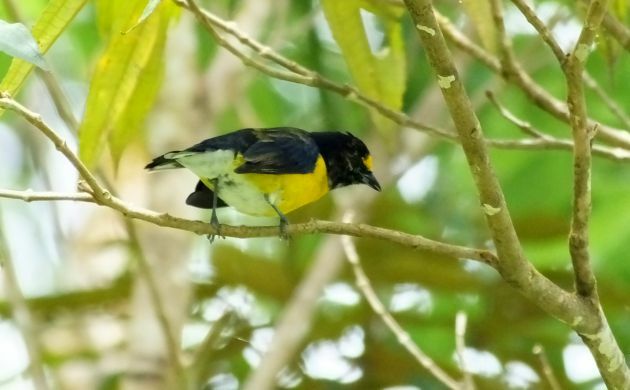 This birding spot is a classic hotspot for two main reasons; (1) it provides fairly easy access to middle-elevation forest, and (2) it connects to the more extensive forests of Braulio Carrillo National Park. Since good stuff can wander in from that national park (by that, I mean rare, fancy birds you don’t see all that often), it’s always exciting to bring the binos to that site. Cinchona- always an easy place for in your face views of hummingbirds and species that visit the fruit feeders. 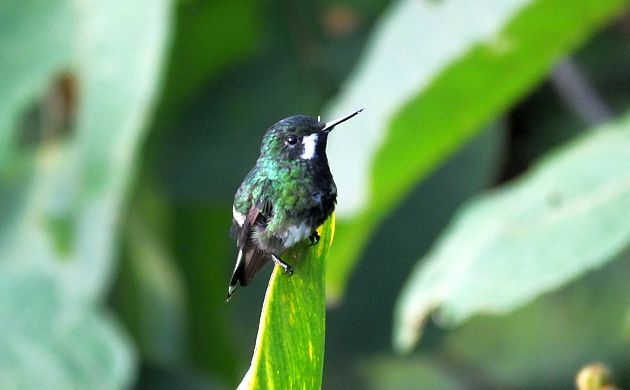 This is a female Green Thorntail. and the Virgen del Socorro canyon because it was hopping with bird song. Zingy Zeledon’s Antbirds sang from the undergrowth, along with Bay Wrens, Tufted Flycatchers (if you saw one in Arizona, it probably wasn’t the same species), tanagers, Tropical Parulas, Spotted Barbtail, and other birds including Thicket Antpitta, the first time I have heard that species at the site. Get there early and you might hear those species, Brown-billed Scythebill, Golden-olive and Smoky-brown Woodpeckers, and maybe even rarities like White-fronted (Zeledon’s) Tyrannulet, and Lanceolated Monklet. The other side of the canyon has better habitat and good mixed flocks of tanagers and other birdies can come through although on Sunday, we just kept moving, only stopping for a surprise Long-billed Starthroat. As we approached the forest above Albergue Socorro, we finally had to stop and exit the vehicle though because there were too many calls of tanagers and euphonias to ignore. Melastome trees were fruiting and they were filled with Silver-throated Tanagers, Scarlet-thighed Dacnis, and White-vented Euphonias. Numbers were impressive, especially because that euphonia species isn’t the commonest of birds in Costa Rica. When we had our fill of Melastome eating birds and looked long and hard enough to feel good about not possibly overlooking any sneaky Lovely Cotingas, we eased on up the rocky road and into the forest. The morning was reaching a late-ish 8:15 but the birds were still treating us well as dozens of tanagers and euphonias fed in yet more fruiting Melastomes. It was a lot more of the same plus Emerald, Speckled, and other expected tanagers and euphonias. As we tried to track some of those birds down, a movement in the forest understory caught our eyes. We raised bins, and voila, Collared Forest-falcon! 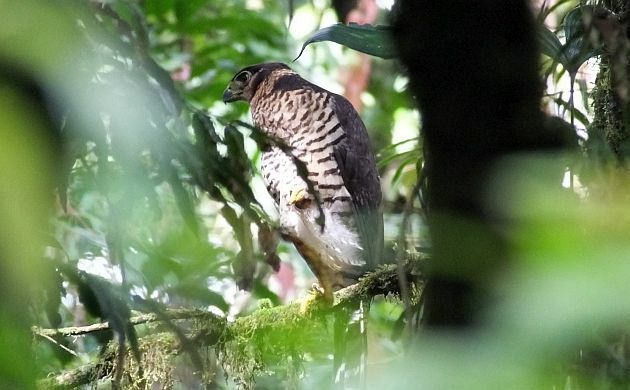 A juvenile Collared Forest-falcon looks for prey. 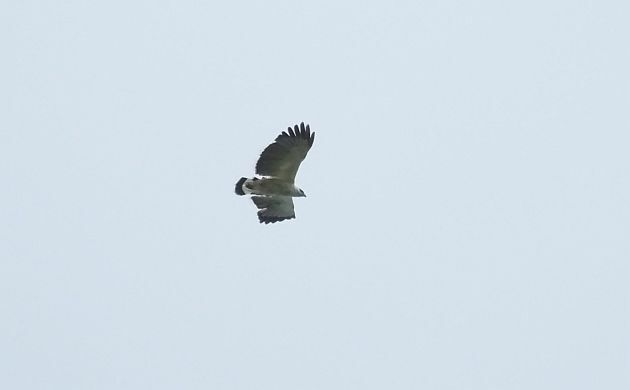 Although this big raptor is common, it’s sneaky and usually one of those heard but not seen birds. 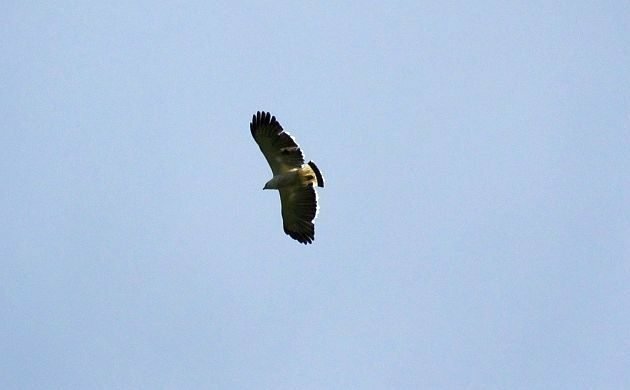 Good forest is usually good for raptors in Costa Rica and when a White Hawk flew into view, wishful thinking provoked a false start as I jumped the ID gun and said, “here comes a Black and white Hawk-Eagle..”. But, nope it was a White Hawk, an expected but always welcome sight. It’s hard not to watch a big, chunky white raptor with black markings. You can’t help but wonder how the heck the bird can look like that and get away it. It was getting sunny, bird activity was falling and we kept checking tree tops looking for surprises. Thankfully, the clouds came back, the birds started moving again and we did get onto a mixed flock. That kept us busy for the next hour as the tree tops became alive with tanagers, euphonias, a foliage-gleaner or two, a couple of woodcreepers, different flycatchers, the hoped for, warbler-like Rufous-browed Tyrannulet, and an even more hoped for male Cerulean Warbler. 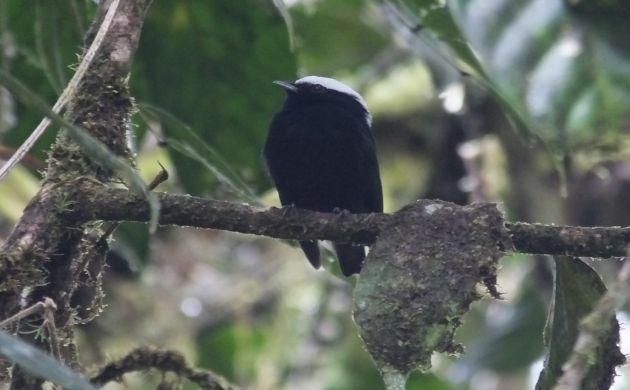 I was hoping we would see one because this is the small window when that rare bird migrates through Costa Rica, and it seems to use foothill and middle elevation forests more than other habitats. Eventually, the clouds did turn into rain but not before seeing Yellow-throated Toucan, and listening to Keel-billed Toucan while getting a few shots of the uncommon White-crowned Manakin. In Costa Rica, this species only occurs in quality middle elevation and foothill rainforest. On that day, the rain cut off the birding by noon but we still managed around 100 species, many of which were uncommon, local birds. Get there early and see how many bird species you can find! See one of our eBird lists from the day, and bird data from the Albergue del Socorro eBird hotspot, and the Virgen del Socorro hotspot.